So here’s my first quest, inspired by a conversation I had with my friend, Liz—learn about the Native American trails that once served as the major arteries through Brooklyn. (I knew Broadway had first existed this way, but didn’t know about any in Brooklyn.) 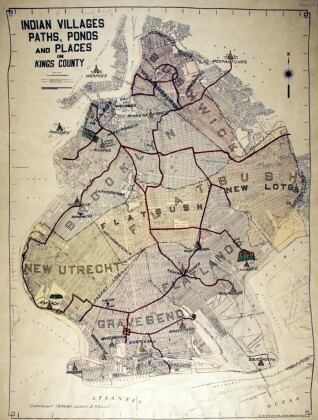 I went to the Brooklyn Historical Society, where a helpful librarian located this map, “Indian Villages, Paths, Ponds and Places in Kings County,” published in 1946 by then-Brooklyn Borough Historian James A. Kelly. If all the tepees are burial grounds, then that means there is one beneath my building in Brooklyn Heights. This would perhaps explain the plumbing issues. Interesting to see some of the trails that exist today as major thoroughfares, like Fulton Street, Flatbush Avenue and part of Atlantic Avenue. I have yet to uncover any information on the Ihretonga, which is the tribe listed as living in Brooklyn Heights. I did, however, learn that the Werpos village of the Indian burial ground had a twin village located around today’s City Hall. One other site I noticed was a park extending from Columbia Street to Smith Street, and from Atlantic Avenue to Kane Street (and labeled as “Sassians” on the map). I guessed it was park of today’s Van Voorhees park, and indeed nycgovparks.org has more information. Stay tuned for Part 2 of Since I’m Not Working: Native American Edition, where I travel one of the Native American trails, and also try and get answers to the above questions. And now I’m off to the 8-4 for the police blotter. See you there. Thanks for the research, Heather. We are the beneficiaries of your unemployment! “a conversation I had with my friend, Liz” Could thisbe that famous native American Liz Warren?? ?